Many students do not have the time to adequately prepare for the exam due to time constraints or other constraints that preclude them from carrying text books or reading in the office. A lot of students starts lectures very late and are not able to adequately prepare for the examination due to inadequate time. It takes more effort and time to learn, reading text books. You can watch the videos on any portable devices – Phones that can watch Videos, PCs etc. Bluetooth Videos on your android devices, tabs etc and play while you go to work. It is the same as if you keep hearing the lecturer anytime you watch the videos. Retention capability is very high with video training. My name is Emmanuel Daniels, a chartered accountant with working experience that cuts across banking, investment banking, oil & gas, manufacturing and trading. I have also been a part-time lecturer for ICAN tutorials since 2002 in a Tuition Centre In Festac Town. Furthermore, I am an IT skills courses facilitator who has trained a lot of professionals -Online and offline courses. My online training courses includes: Advanced Excel, VBA Programming, Ms Word, Sage50, QuickBooks, HTML Web Design, Advanced PowerPoint, Ms Access etc. 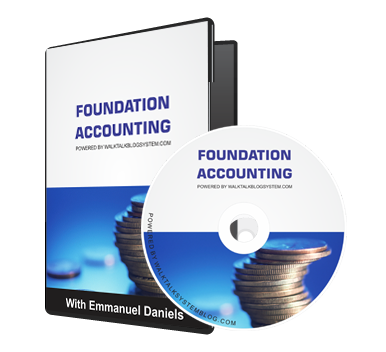 As a corollary to the above and with the objective of facilitating learning for the preparation for ICAN exam, at the Foundation Level, I have created a Complete video lecture course on Financial Accounting that you can walk through on your own, and give you guaranteed Success in your examination. Also I can bet you, that you will not find this kind of video training anywhere, that teaches you in a very practical and interactive way. You can watch the videos even on your mobile devices. No Need To pay for cost of carriage. You can get the videos delivered instantly anywhere you are on planet earth. You have flexible access to receive more tutorials as they are made available without the limits imposed on CDs etc, just with a one-time payment.